Surprise your friends! 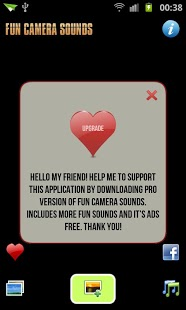 Make them smile on the camera with one of the many available sounds. Have fun! In order to give you a free app and keep developing more free apps in the future, we are integrating a search tool to our application. This will add a few access points to your device (hence the permissions) to direct you to the web search service. Please consider using the search to help us keep creating apps. You may delete the search icon, bookmark and homepage easily. Thank you!